Magnificent. You win this round by a full length. 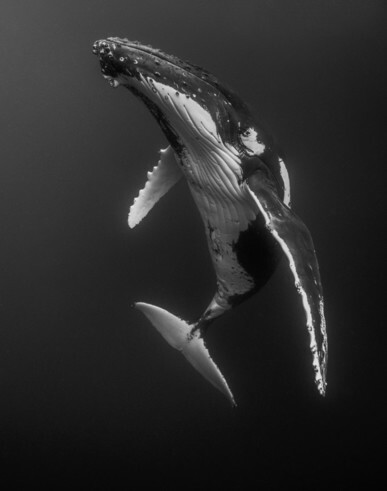 The beautiful tones and detail, the graceful allure of the whale, the so simple composition and faultless monochrome of the vast dark depths all come together to make this very pleasing image. Well done, extraordinary work! What a tremendous and amazing honor to have my image of an adult humpback whale (Megaptera novaeangliae) selected as the top image. My name is Shane Keena and I am based in Redlands, California. 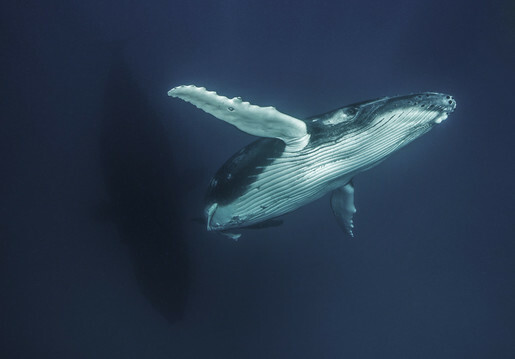 For this image we were swimming with a pair of whales off the coast of Ha'Apai in the Kingdom of Tonga when this whale began slowly ascending to the surface. This magnificent creature slowly went vertical giving me a couple of seconds to reset my focus points and switch to portrait orientation. Canon 5D3, 16-35 f/2.8, Nauticam housing, Zen 230 Dome port. Processing in Adobe Camera Raw, Nik Silver Efex Pro Thank you again for this wonderful award and kind words! 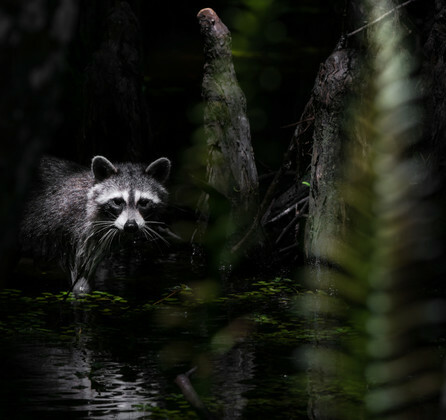 It is the beautiful wild environment that frames the raccoon which makes this so special. The square format works well too. It is lovely and dark, beautifully exposed with a nice short depth of field. Nice indeed. 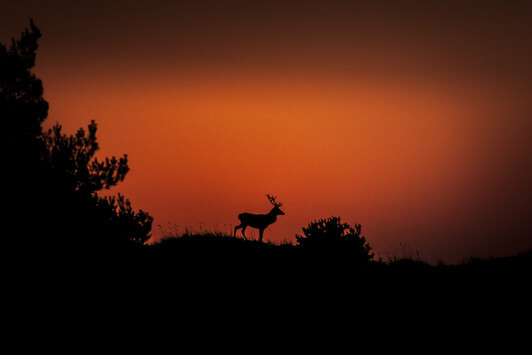 Perfect and simply lovely, well done, this was surely a magic moment. The very high contrast of this image makes nice texture and helps enhance all of those drops of spray. You have caught the movement just fast enough to show off Mother bear’s physical power, and fierce look, thanks to that very important eye. Photo by Angela Poggioni. 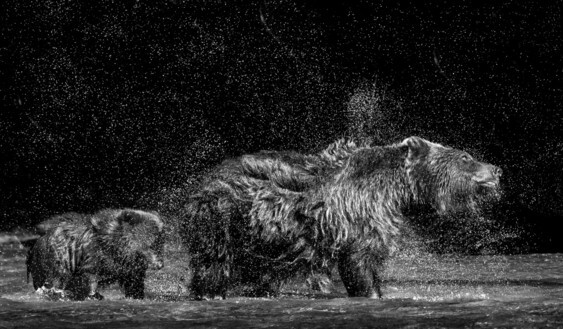 Thank you for recognizing my image of mother and baby Grizzly taken in British Columbia during the salmon run. The picture was taken free hand with Nikon D750 and Nikon 200-500mm lens. I converted the photo in black and white in post processing. This is exciting, but i’m not quite sure i see what is happening here - i hope it’s mother and cub and that it is friendly :-) But despite that your photo is appealing, the bears and the water seem so real with that shutter speed and the vegetation behind is interesting, though a little lost in a dark vignette. Maybe in a case like this when the close-up action isn’t so clear a wider shot with more of the scene could work better, the bears would become part of the beautiful environment and their actual actions wouldn’t carry so much importance. This photo was taken at Brooks Falls, Alaska. It was September and the bears were fattening up for the coming winter. Every day we would see this big male fishing for salmon in the same spot. 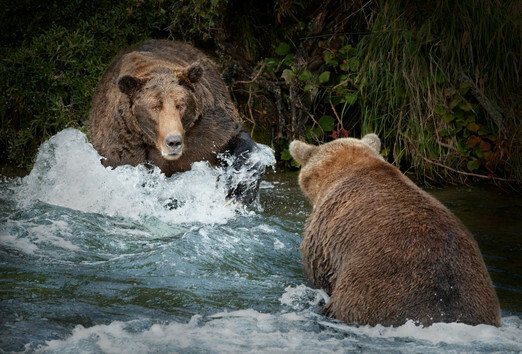 This day a young bear decided to approach him, and the look on the big male's face was one of surprise that the young bear would even dare to enter his fishing spot. As it turned out the young bear backed off and a fight did not take place. 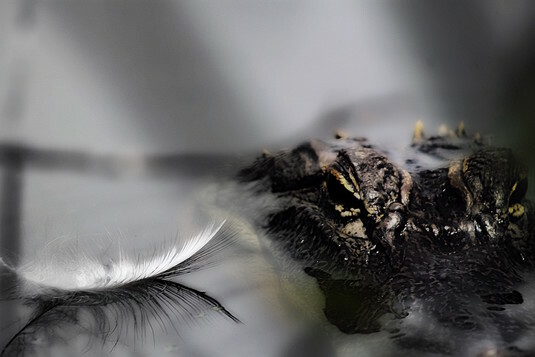 Well here is an unusual eye-catching shot with lovely textures and colours. One can imagine all sorts of scenarios without ever being sure where the real story is. Is that crop too tight? Maybe, but an engaging shot in any case. 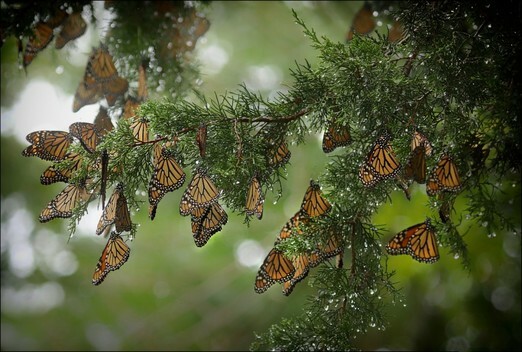 This is enchanting, all those butterflies hanging like raindrops from a branch with a nice soft back light. Well done and original. Thank you I'm glad you found my shot worthy. It was a real privilege to have hundreds of Monarchs visit my backyard for three days on their migration south. 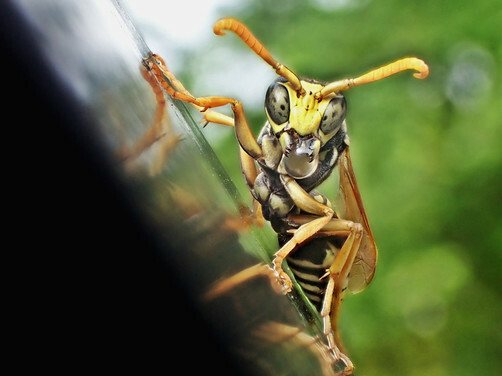 Well done for the shiny reflective surface and for composing this graphic setting for wasp to show us how handsome he is. What a look he has in his eyes! The bokeh really sets him up for a smashing portrait. There is a wonderful balance in this photograph, nice composition and several distinct layers and that has brought you through. 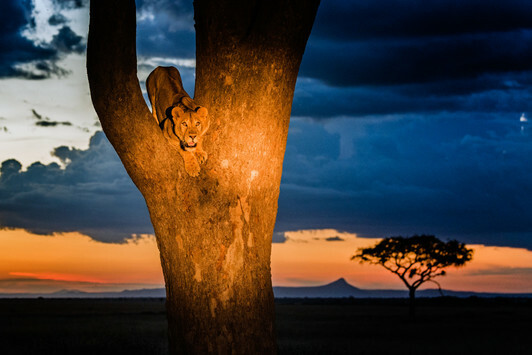 But I guess that is a spotlight shining on the lioness, which on one hand has knocked your colour balance, and on the other has most likely disturbed her.